As far as Ankara is concerned it regards them as part of the Syrian wing of the Kurdistan Workers’ party (PKK), a designated terror group that has fought a decades-long insurgency against the Turkish state. Only a fool would have ignored the warning signs and yet here we are today with Nato allies expressing surprise and concern at the military offensive. Ankara has repeatedly expressed anger at the YPG’s expansion in northern Syria and questioned American involvement since the US has openly backed and armed the group as it spearheaded offensives against Daesh in the region. Sadly the West has once again underestimated the Turkish President Recep Tayyip Erdogan naively believing as a Nato ally he would fall in line with US-led foreign policy. He warned he wouldn’t and today he has proved to be a man of his word. The Afrin offensive came after a US announcement that it would train an army to patrol Syria’s borders that would include the YPG as a key component. Turkey is not a servile colonised force willing to submit to the West. It intervened in the Syria war back in August 2016 to limit the Kurdish expansion west of the Euphrates river. While doing so it also drove Daesh, which controlled key border towns, out as well. In short the West has driven Turkey to take this unilateral military offensive in Afrin but what should be more concerning to Nato is that it has obviously been done with the blessing of Russian President Vladimir Putin. Surely it was obvious if Nato countries were going to ignore Turkey’s dilemma someone else, operating in the region, would step up to the plate. One can only conclude that the US and Nato is becoming increasingly irrelevant not only in Syria but in the Middle East as a whole. The region is reshaping its landscape and the powers emerging now appear to be Russia, Iran and Turkey. On the surface of it all, this seems to be good news for Bashar al-Assad, the despotic leader of Syria, who is inching day by day to ending the seven-year war through a military victory in his favour. Again, the west is as much to blame for its lack of action and understanding of the region. More importantly, perhaps due to the arrogance and ignorance of the Trump Administration, the US is fast losing its influence. A couple of years ago it would have been inconceivable for Turkish troops to join Syrian backed rebels to attack PKK but YPG armed by the US but that is exactly what is happening on the ground today. There appears to be a groundswell of support from Turkish people for Erdogan’s military offensive against his country’s age-old foes. He says the Kurdish military presence are not only a threat to Turkey’s borders but they are illegally occupying Syrian lands which should be returned to their rightful owners. 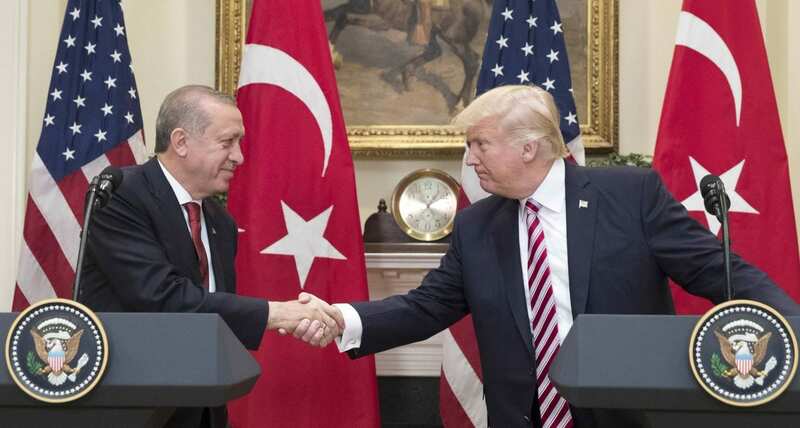 The US is calling on Turkey to stop its military action but while Ankara insists it is still a reliable and dependable ally of Nato it is clear the attack on the Kurdish military presence will not halt. The rapprochement between Russia and Turkey is bound to cause concern with Nato but no one has done more to destroy Daesh and help Western intelligence against the terror group than Turkey. However Erdogan’s warnings, pleas and calls for the last five years have been ignored by his Nato allies and now that is coming back to haunt them as they are powerless to help and intervene on behalf of the Kurds. Meanwhile France is calling for an emergency session with the increasingly toothless UN Security Council but there is little the UN can do – or has done – for the region. Daesh has become an insignificant sideshow and Western policy has little or no impact on Middle East policy … again critics can look to the Trump Administration for the breakdown. Trump announcing Jerusalem as the capital of Israel, despite all the warnings given by Ankara and elsewhere, did not help. Erdogan has just given the West and Trump a bloody nose for ignoring the consequences of blundering in to the Muslim world and trampling on its cultural and religious sensitivities. However, because of its geopolitical position, Turkey will remain a cultural bridge between Asia and the West. Deadly storm is shredding through Europe and causing mahem – 5 people have been killed!